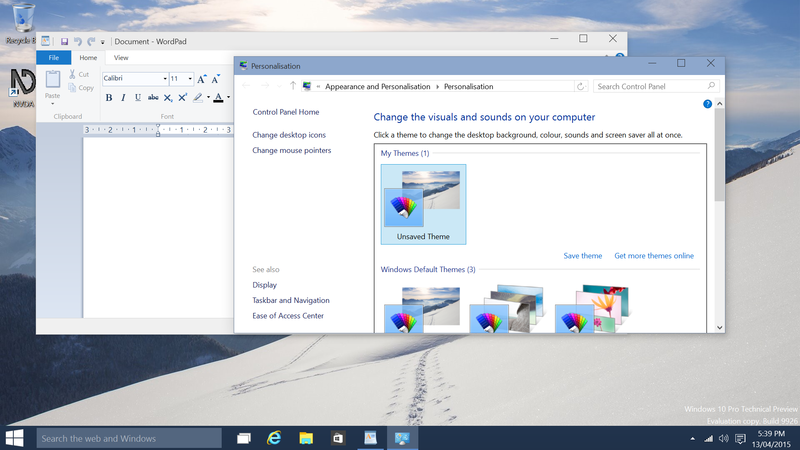 An initial, low vision look at the Windows 10 technical preview. | 22 Point Blog! 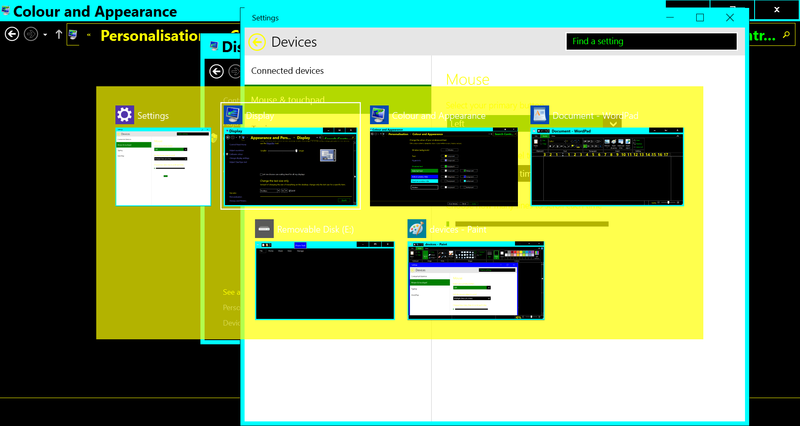 An initial, low vision look at the Windows 10 technical preview. Windows 10 is scheduled for release around September this 2015, and as is usual, there is an early version, called a “Technical Preview” available for people to look at. It’s freely available to anyone, whether you are a software developer, IT teacher, technical writer or just a curious consumer. The main point to be aware of are that while it will have some of the new features coming in Windows 10, it is beta software, and things might not all work, so it’s not recommended to use it as your daily PC just yet. I’ve had a quick first look at the technical preview, and while there are plenty of sites detailing some of the key features which are new or updated, I’ve included my thoughts here as a low vision user. Firstly, if you’re still using Windows 7, please jump over here for my quick primer on Windows 8 to get you up to speed. 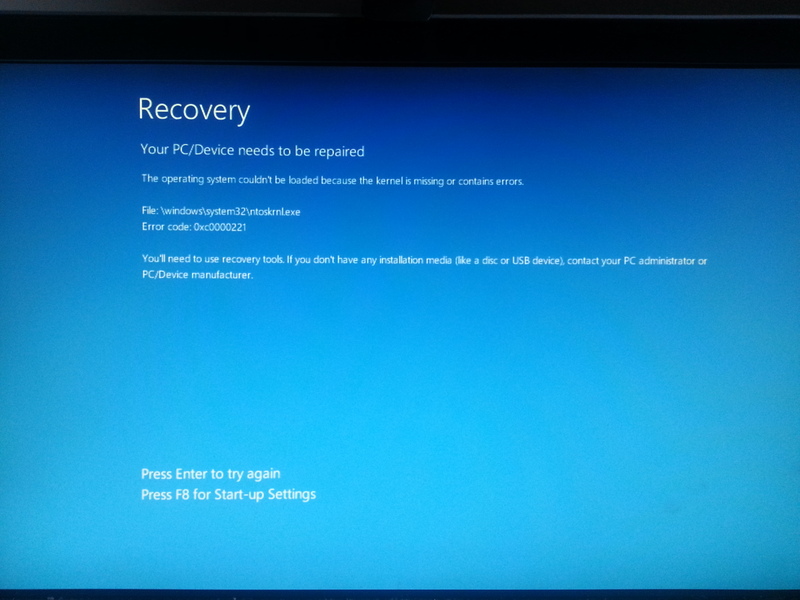 Ok so lets get to Windows 10. Microsoft have announced that it will be a free upgrade for anyone running Windows 7 or 8, which indicates that its hardware requirements should be relatively low. In order to fully test this claim, my chosen Windows 10 test machine is a 2006 vintage HP Compaq dc7600 with an Intel Pentium 4 640 / 3.2 GHz, 80GB HDD and 1GB RAM. This machine never actually saw action with Windows 7 – it shipped with Windows XP and that’s what it had on it (in storage under the couch) until I bumped it up four releases of Windows at once this week – quite an amazing feat in itself – could you imaging taking a Windows 98 machine and slapping Windows 7 on it? I’ve run Windows 7 on similar vintage machines and I have to say that while it worked ok early on, by now Windows 7 actaully runs a lot slower than it did on release and so running Windows 7 on this vintage machine is no longer pleasant. In actual fact, running Windows 10 on this machine isn’t overly great either, but it is possible, which means that most machines people have at home which shipped with Windows 7 from the shop should actually run better than they have in years under Windows 10. As someone who still uses Windows 7 for my daily driver, I found the initial presentation looked more or less familiar, which was a relief given that the interface is most hated aspect of Windwos 8. You first get to a welcome screen with the time and list of users, you pick your user profile, type your password and then you are presented with a big pretty picture desktop background, with icons, a taskbar with system tray and clock and a start button. As a low vision user, one of the first things I did was fire up the magnifier by pressing WINDOWS and +, and indeed, it looks and works exactly as it has since Windows 7, and the options are the same as well (including the strange omission of leaving “Follow the keyboard focus” and “Have magnifier follow the text insertion point” both unchecked. If anyone knows why they are unchecked by default or why you wouldn’t want them checked please do let me know as I’ve been curious since Windows 7 came out! Going into personalisation (I right clicked on the desktop and chose the bottom option in the context menu, but you can get to it from the search box – no difference there), I noticed the first difference – there is no real border around Windows now. Microsoft have gone for a Modern, Metro, Material, Minimal, whatever you want to call it, design which is aimed at being simple, clean and refreshing. (There I think I’ve covered all the appropriate buzzwords!) In any case, while I like it well enough overall, I do find the lack of a border to define where windows end somewhat jarring, particularly as it means if you have windows overlapping each other, it can be very hard to tell where one ends and the next begins. The nice big red mouse pointer there isn’t a new feature in Windows, it’s a custom mouse pointer I made in Windows 7, which I could copy just fine into Windows 10. The default stock of mouse pointers really hasn’t changed since Windows 7, nor has the mouse options, so a custom mouse pointer like this is a good idea. There are a range of full mouse pointer sets, including this red one, available from the 22 Point Website here. 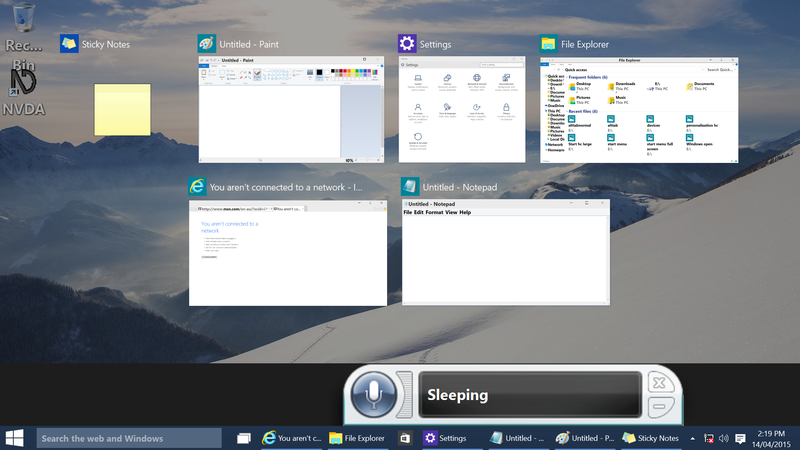 The Start menu itself actually looks pretty traditional: text items with icons on the left, and on the right something which looks like the Windows 8 start screen. I could move around the start menu with the keyboard without problem (although as in the screenshot above, the mouse hovering over an item will visually highlight it, though the keyboard focus may be elsewhere entirely. In Windows 7 you had your programs on the left and your settings and abstract folders on the right (Documents, pictures, control panel etc). In Windows 10 you have some of each on both sides. I’m not sure how best to rearrange it, but the left side certainly appears fluid with it’s “Recently added” and “Most Used” sections as well as a “Places” section which currently has File Explorer, Documents and Settings under it. In Windows 7 you could pin things you used frequently to the start menu, and while that option does seem to exist in Windows 10 (if you go to the All apps list at the bottom of the start menu, you get an alphabetical list of everything sorted by letter, and you can right click or press the CONTEXT menu key to find “Pin to start” as an option. You can also choose a file of any type from Windows explorer, but it doesn’t appear in the default context menu, you have to press SHIFT and right click or shift+context menu key before it appears), I did try pinning a couple of items to the start menu and they never appeared there, so I presume that’s a work in progress. 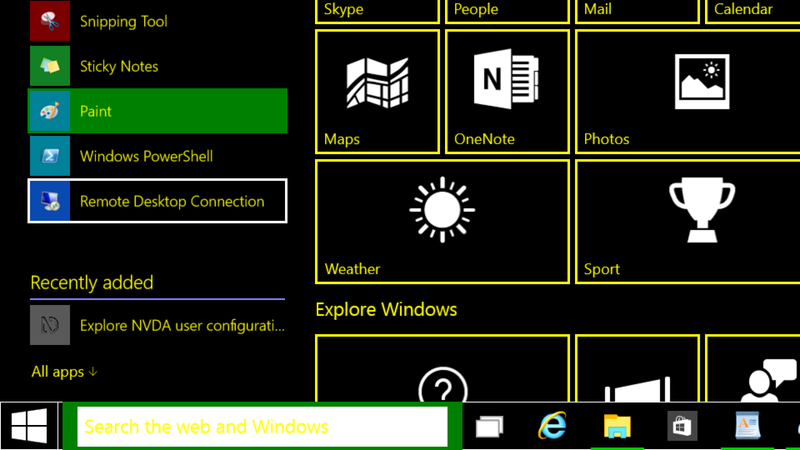 You can also expand the start menu to take up the full screen and look similar to the Windows 8 start screen, which mostly gives you more access to those “right side” tiles, including live tiles for things like current news and stock market fluctuations. WINDOWS+TAB has been a flashier but less well known alternative since Windows 7. I found it confusing in Windows 8 as it didn’t treat all windows the same (anything which didn’t run full screen was lumped into a “Desktop” category, and in Windows 10 I must confess I still don’t really get its purpose. It now presents you with previews of all of your Windows in a grid on screen overlaid over the desktop, and you can arrow through them or click on the one you want – pressing it again toggles between this view and the last window which had focus. The main benefit I can see would be that you don’t need to hold down two keys continuously, which would definitely be useful for some, though I much prefer the ALT+TAB interface visually. 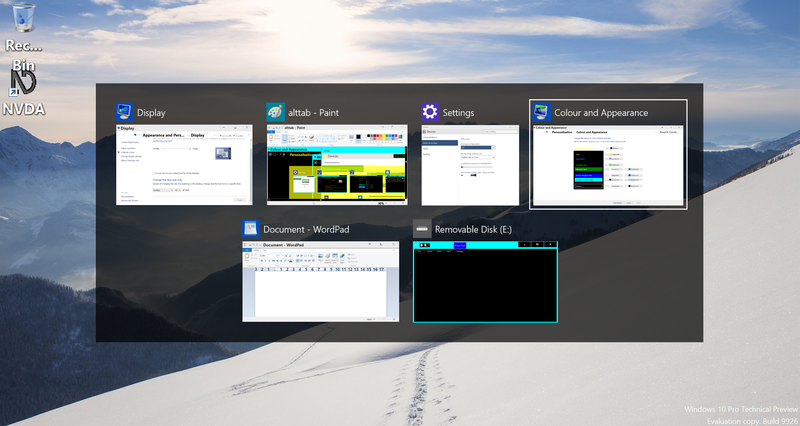 One thing which was an issue in Windows 7 was that you could choose one Windows colour which shaded your taskbar, ALT+TAB window and title bars, however the text in some (Title bar and ALT+TAB) was black whereas the text in the taskbar and Start Menu was white making it hard to choose a well contrasting colour. In Windows 10 this still seems to be the case, although the ALT+TAB menu now uses a straight dark background with white text, only leaving window title bars with black text, so overall a dark windows colour seems to work best. Finally, the other big thing I came across was Cortana. 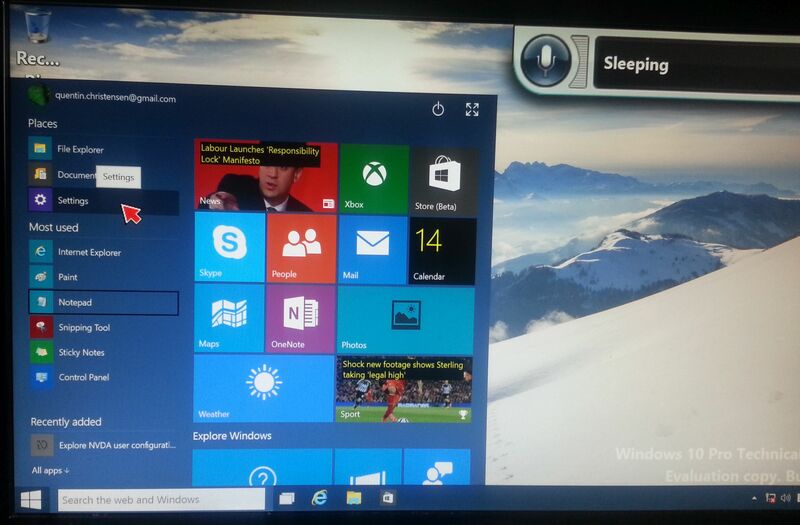 Familiar to smart phone users, the ability to issue spoken commands to your PC will be integrated in Windows 10. 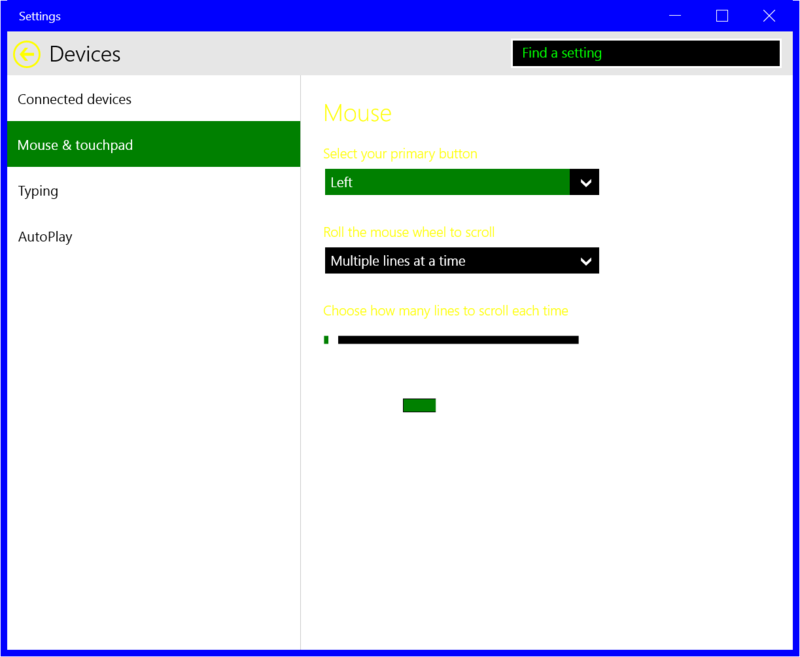 At this stage it isn’t as fully integrated as the Microsoft promotions tell us it will be, but it does work. I must confess I skipped through teaching it my voice so it’s not as accurate as it would otherwise be if I hadn’t been lazy, but I could get it to open and close programs and dictate text. One amusing incident was when I had a phone call while playing with it, even though I wandered over the other side of the room, it still picked up random snippets of the conversation and opened and closed things (I’m pretty sure we never actaully said “Num Lock off”, or “Open network locations”, but it helpfully did those for me anyway). The system has the option of either being manually turned on or off, or a constant listening mode where you can say “Stop listening” to put it to sleep and “Start listening” to get it to start listening again. One issue I did encounter, was when using a screen reader such as Narrator or NVDA, Cortana would listen to the output of the screen reader, and try and decipher it as commands. So unless that changes, if you want to use Cortana AND a screen reader, you’ll need to wear headphones. Cortana at this stage also didn’t give any verbal feedback of commands as say Siri or Google Now does. Otherwise I can certainly see it being a preferable method of input for some users. Microsoft unfortunately still haven’t figured out that white writing on blue isn’t the best contrast, and unfortunately their blue is getting lighter, but the important bit of the message reads “The operating system couldn’t be loaded because the kernel is missing or contains errors.” and going on to suggest either using a recovery CD or contacting my manufacturer. Luckily for me, I recently bought my wife a new laptop! 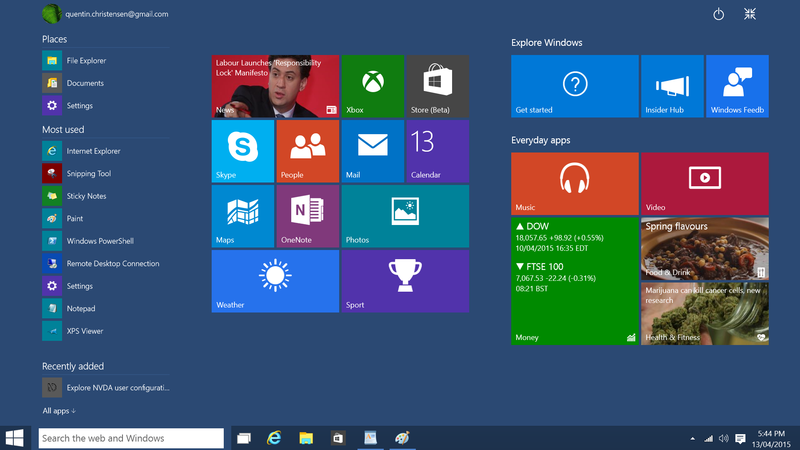 Have you tried the Technical Preview of Windows 10 yet? What did you think? This Post was tagged accessibility, cortana, low vision, windows, windows 10. Bookmark the permalink.